Matching versatility, value, safety and security, the 2009 Kia Rondo is a decidedly attractive choice for anyone in a one-vehicle household. The top-line EX, particularly when upgraded with the optional Premium Package with navigation, makes a very inviting daily driver. 4 cylinder- 7 passenger Kia rondo. My 2009 Kia rondo is great on gas as it is a 4-cylinder engine. Has 3rd row seating and does not make you feel like you are driving a minivan. I have had issues with the power steering, haven't found a solution, the back windows are now not working and the parts are special order and not currently available to order. Other than these issues, it has been pretty reliable and pretty comfortable. We fit 7 of us in the vehicle. When 3rd row is not in use, you can fold down and have trunk space. 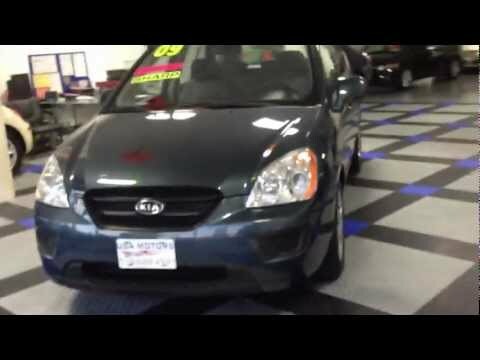 09 Kia rondo. Only problems I have encountered have been the replacement of my camshaft position sensor which seem to affect gas mileage, heavy shifting, and a few other minor issues. If left unreplaced, the vehicle has been known to die randomly. Reliability it has been decent, good gas mileage, sporty crossover with hatchback. No problems with leaks or anything although it has a hard time getting up hills and the headlights visibility is not the best. It came with a great warranty and didn't need it. It's been very reliable. My car is perfect for me. Small enough to drive like a car but big and roomy enough to tote stuff and carry my dogs around. It has had very minimal problems and runs great it's been really reliable. Only complaint is the lock issue. One of my back doors locked and won't unlock and I won't pay to fix it right now..lol. But I like the car a lot.